(Toronto, Ont) The top women’s wheelchair basketball teams on the globe are making final preparations for what promises to be eight days of fierce competition at the largest women’s world championship in history at the Mattamy Athletic Centre in Toronto. The 2014 Women’s World Wheelchair Basketball Championship runs from June 20-28 and features 12 teams from three International Wheelchair Basketball Federation (IWBF) zones as they vie for the highly coveted world championship title. In Pool A, sports fans can watch potentially heated matches between several contenders including Paralympic silver medallist Australia, Paralympic bronze medallist the Netherlands, and the reigning world champions from the United States. Peru, making its debut on the world championship stage, along with France and Mexico round out the group of teams battling for position in Pool A. Pool B features reigning Paralympic champion, Germany and host and defending world championship bronze medallist, Canada. Podium hopefuls China, Brazil, Great Britain and Japan will also compete for a top spot in Pool B. Fresh off its gold medal at the London 2012 Paralympic Games, Team Germany is in search of its first world championship title, and boasts a deadly combination of speed, versatility and all-around skill. The team includes ten returning players from the squad that battled to Paralympic Gold in London and promises to make a serious impact in Toronto. Host Team Canada will be competing for an unprecedented seventh consecutive podium finish at the world championship and is looking for redemption coming off a sixth place finish at London 2012. 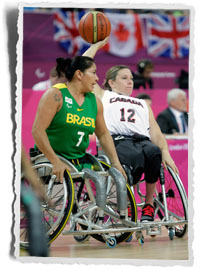 The Canadian roster features offensive star Janet McLachlan, who led all players at both the London Paralympic Games and the last world championship in total points scored and rebounds. Veteran Tracey Ferguson, a three-time world champion and three-time Paralympic gold medallist, brings valuable experience to the team looking to re-establish itself as a dominant force in wheelchair basketball. With eight players returning from the Paralympic team and five with world championship medals under their belt, the Canadian women seek to use that experience to capture a spot on the podium. Confidence is high for Team Brazil after going undefeated at the 2013 Americas Cup for Women. With Lia Maria Soares Martins, who averaged the most points scored per game at the 2012 Paralympics at the helm, and more experience as a team, the Brazil women will be fighting to move up the world rankings following a ninth place finish in London. China is the number five ranked team coming out of London 2012, having climbed the rankings since it made its world championship debut in 2010, placing eighth. China will strive to crack the podium for the first time ever under the leadership of Long Yun, the Asia-Oceania Championship MVP, as the team heads into the 2014 World Championship. Great Britain has a relatively young squad looking to build on its seventh place home court finish at the London 2012 Paralympics. With eight players returning to the team from 2012, the Brits are poised to start climbing the world rankings. Rounding off Pool B, the Japanese women are looking to build on their notable world championship experience. Despite having missed out on the London Paralympics, Japan has competed at every world championship except the inaugural event in 1990, finishing just off the podium in 2002 and 1998. In Pool A, the Netherlands put forward a well-rounded team headlined by high scorer Mariska Beijer and swift ball handler Inge Huitzing. Strong and versatile, the Netherlands is a serious contender. The team eked out a victory over Germany by one point during the European qualifier, and aims for similar success in Toronto. Australia, ranked second in the world, is on the hunt for its first world championship crown and seeks to break a 12-year podium drought since it last won a bronze medal in 2002. 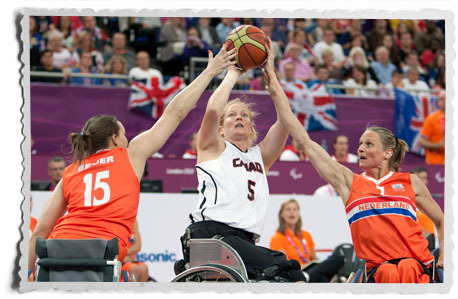 Coming off Paralympic silver and bronze medals in 2012 and 2008, respectively, the team’s full-court full-speed style of play makes them a formidable opponent. The United States is a perennial powerhouse and the defending world champion. The versatile American line-up can ball handle, sink the mid-court shots, and keep up the pressure. The team has enjoyed outstanding success at the world championship, having played in every gold medal game since the inaugural tournament in 1990. The American women, however, finished just off the podium at the 2012 Paralympics. Mexico, coming off a second place finish to Brazil at the qualifier, looks to improve upon a ninth place showing at the last world championship. While Mexico has traditionally played the role of the underdog in the past, the team will push to break the mould in Toronto. France is set to return to the world championship stage for the first time since 2006, where the team placed eighth. The French women hope to build on their fourth place finish at the 2013 European Championship, where the team seized the final spot for the right to compete at the 2014 World Championship. Peru will make its debut on the world stage of wheelchair basketball in Toronto. The team placed third at the 2013 Americas Cup for Women to capture the last available berth to the world championship. The team will be looking to make its presence felt on the court in its first major international competition. The tournament gets underway at 8 a.m. on Friday, June 20. Preliminary play wraps up on June 24, with the quarter-finals and semifinals set for June 26 and 27, respectively. The bronze and gold medal games will play out on Saturday, June 28 starting at 1 p.m. ET. Tickets are on sale online and all games will be webcast live via the tournament website. 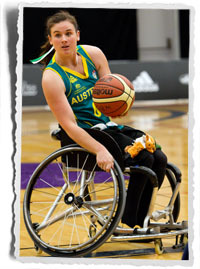 For more information visit www.2014wheelchairbasketball.com / #2014wcbasketball.